50 | TH E M R EP O RT O R I G I NAT I O N S E R V I C I N G DATA G O V E R N M E N T S E C O N DA R Y M A R K E T DATA THE LATEST Builders Expect Strong Years Ahead A survey shows that homebuilders anticipate a rise in residential construction over the next two years. H omebuilders are largely optimistic about 2017, with most expecting a rise in residential construction volume over the next two years, ac - cording to a survey of construction profession- als at the Atlantic Builders Conference in April. Conducted by TD Bank, the survey re- vealed that 82 percent of builders anticipate a rise in residential homebuilding over the next two years. That number is up from last year when 75 percent shared the sentiment. On the client side, the survey found that most builders—38 percent—expect their buyers to need 30-year loans, while 25 percent anticipate construction-to-permanent loans. According to a release from TD Bank, construction loans will likely be in high demand this spring. "Spring homebuying season is in full swing, and consumers need construction loans. In fact, about one-quarter of TD Bank's loans are coming from new construction." Construction-to-permanent loans offer buyers an easier solution than most other con - struction financing options, TD's release stated. "What these borrowers don't know is that they only have to go to the closing table once. They can execute a one-time close up - front, instead of getting a construction loan, paying it back and then obtaining another permanent mortgage for their home. They can lock into one interest rate at the start of construction, keep that rate until they refi - nance, pay off the loan, or sell their home. This also saves on closing costs." In regards to the market's rising mortgage rates, builders are mixed on how they will im - pact business in the coming year. Thirty-seven percent said they expect activity will remain unchanged, while 34 percent rates will likely result in decreased home sales and purchases. TD Bank also surveyed builders about the challenges facing buyers today. The major - ity said financing approval and affordability, credit approval, and timeline constraints were the biggest issues. Builders also shared their thoughts on working with mortgage loan officers in their transactions. More than 60 percent said quick turnaround times and response times are the most valuable assets a loan officer can have. Accessibility and guidance in navigating the finance process were also high on the list. 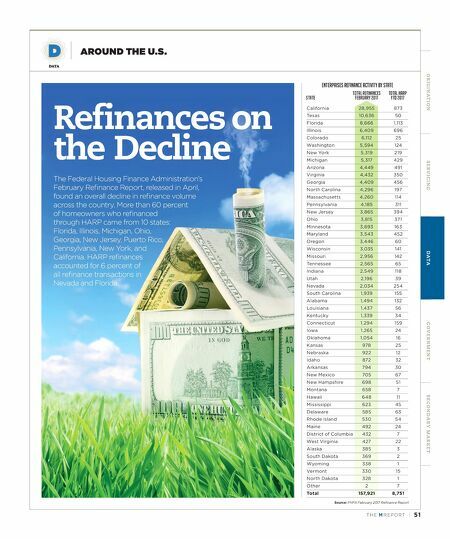 www.fico.com/ficoscore9/mortgage © 2016 Fair Isaac Corporation. All rights reserved. Is your migration plan ready? 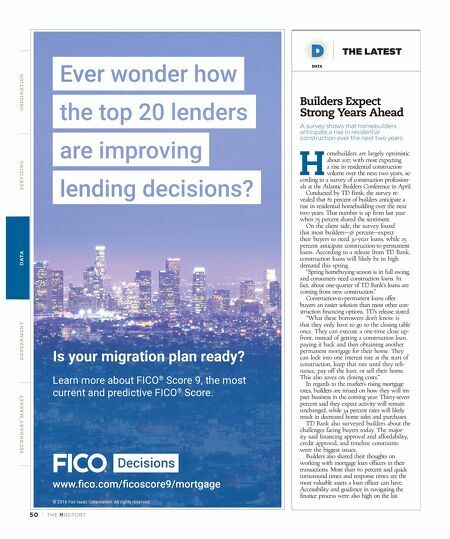 Learn more about FICO ® Score 9, the most current and predictive FICO ® Score.